Stepney Alured Clarke began the first store at Cadia in September 1861. His background has not been researched, but it is possible he was well known to John Penrose Christoe and even the Blood family, from Kapunda. On 29 September 1861 he took out a seven year lease of one acre of land from the company for £10 a year – Clarke’s One Acre. On this he built the Cadiangullong Store to supply the miners and their families. Clarke was in partnership with William Smyth Blood, the son of Dr. Matthew Blood, a fact revealed in 1863. On 7 March 1863, Clarke and Blood were forced to assign their business to James Dalton, junior, of Orange, and Robert Frost, butcher, of Orange, as trustees to cover their debts. On 28 February 1863, the store at the mine held £506/10/0 worth of stock as well as £887/17/0 worth of debts. William Smyth Blood also had to forfeit a Conditional Purchase of 82 acres, 1 rood in the Parish of Blake, taken up on 1 November 1861. Clarke appears to have continued in the store on behalf of Dalton Brothers, since he signed the 1863 Post Office petition in their name. He was also licensed to sell spirits at the store in 1864 and 1865, though not in 1866. He remained in the district for some years, being listed on the electoral roll with a Residential Qualification, living at Cadia until 1874. In 1877, the preachers for the Methodist Church circuit included “Clarke” of Cadia as an “exhorter”. The other shopkeepers at Cadia are revealed in the application for a Post Office, made in October 1863. It stated that the village possessed two stores, and one licensed victualler, as well as “others carrying on other trades”. These included G. Ryecroft, licensed butcher; H. Hicks, of the Bon Accord Hotel; Francis Tate, storekeeper; Pierce and Hillier, storekeepers, and also S. A. Clarke “for Dalton Brothers”. While Clarke and Blood continued to work as a subsidiary for Dalton Brothers of Orange, the leasehold of the land was transferred to George Rycroft, butcher, as well as the portion of 82 acres on 26 May 1863 for £140. 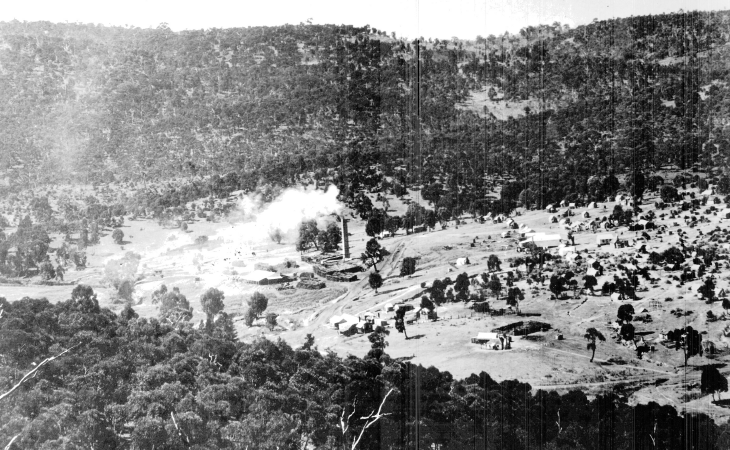 Rycroft had originally been at the Canoblas Mine, but moved to Cadia as the focus of mining work shifted. George Rycroft had married Alecia Bailey in Orange in 1858. On 1 January 1860, he was granted a slaughtering licence, which was renewed until 28 February 1866, when the extant register finishes. Rycroft became a school patron in December 1863. He remained in the area for a few years, but on 11 December 1865, sold the conditional purchase of 82 acres to Robert Frost, butcher of Orange, for £100/6/3. Rycroft left the district and died in Parramatta in 1887. A number of others applied for butcher’s licenses in the area. Among these, Francis Tate, the storekeeper, was licensed in 1864, W. S. Blood in April 1866. Humphrey Hicks opened the Bon Accord Hotel by 1863, named after the Bon Accord Mine at Burra, South Australia. Although Hicks remained as licensee, the name was changed to the Royal Hotel in 1870. The hotel may have temporarily closed in 1870, but Humphrey Hicks was still listed as the hotelkeeper in Greville’s Post Office Directory of 1872. During the 1870s, the hotel was rented by Robert Roberts, but had closed by 1881. John Noonan, the licensee, shifted the licence of the Royal Hotel to Forest Reefs between July and September 1881, where it became the Forest Reefs Hotel. A hotel did not reopen in Cadia until the village boomed again in the new century. The closure of the mine in 1867 had a major impact on the stores, shops and hotels at Cadia, as clearly illustrated by the case of Benjamin Derrett, storekeeper. Shopkeepers in small mining settlements were prey to a number of risks. They had first to keep a close watch on creditors and debtors. Then they also had to make the most of opportunities at new mines before others. It was certainly not good practice to be left with bad debts when the miners had departed. For shopkeepers providing retail services there was thus a strong incentive to shift to boom towns, though this was tempered by family connections and the need to educate their children in a stable environment. This view of Cadia Village was taken between 1905 and 1907, before the main street, Chilcott Street, was fully developed. The photograph shows the older centre of the Village near Cadiangullong Creek.